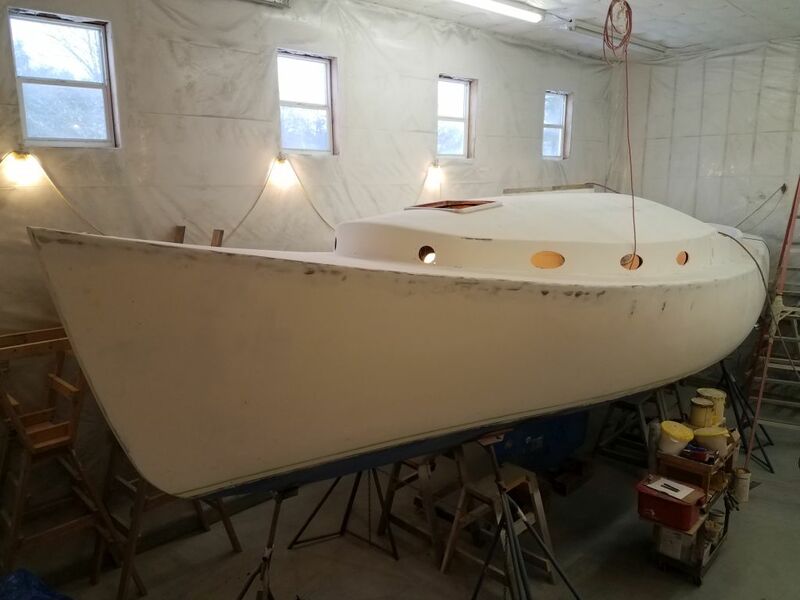 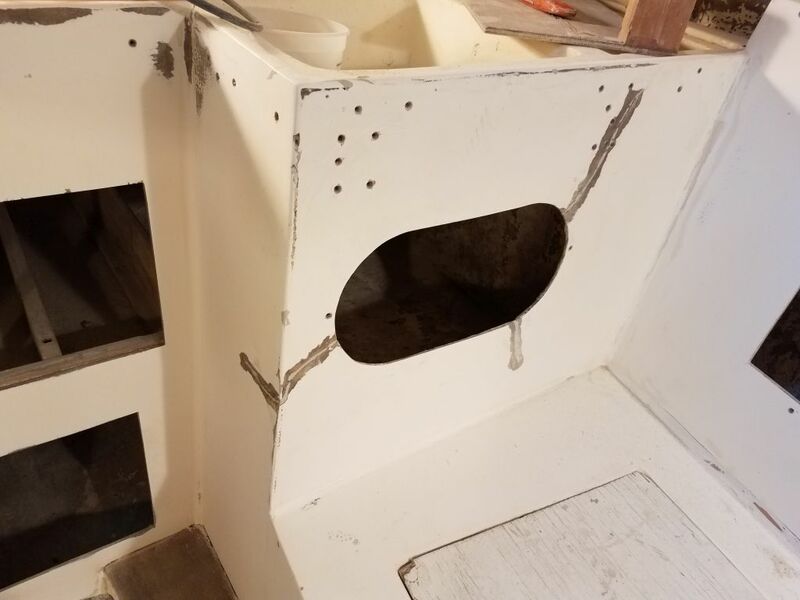 After a mid-morning start following some errands and other business, I continued finish-sanding work on the remaining surfaces in the main cabin, including the port settee, both sides of the cabin trunk, and the galley area. 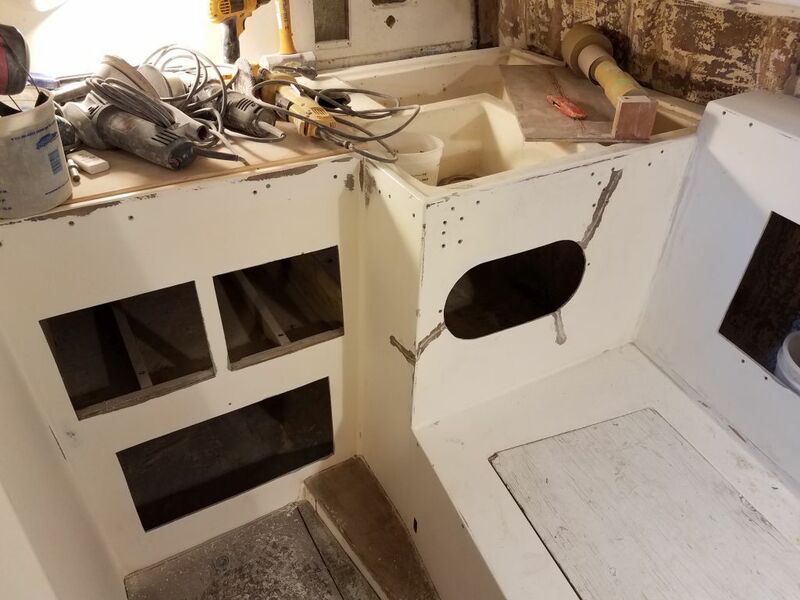 When I was through with the larger tool, I switched to a small palm sander and 120 grit paper and finished up work on various corners and tight spots to complete the basic prep work in the main and forward cabins. 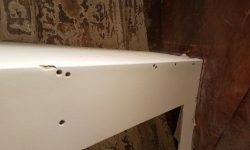 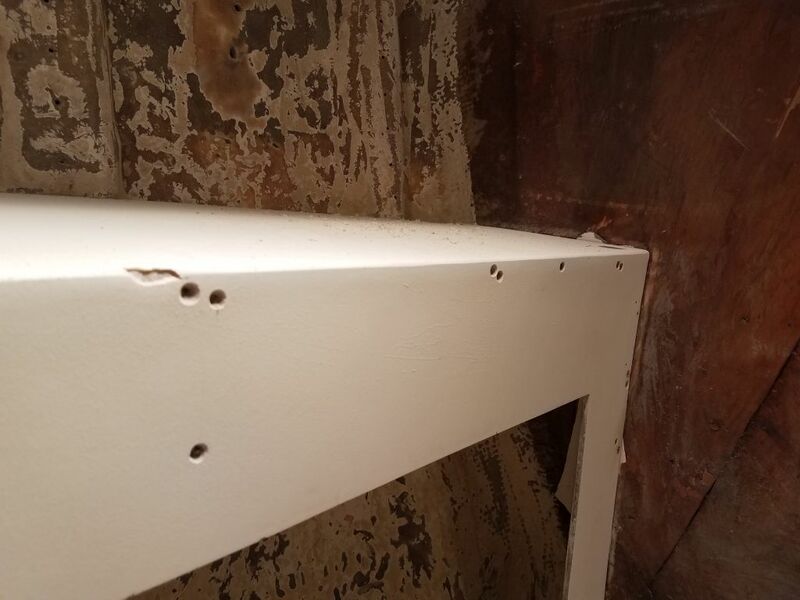 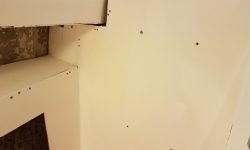 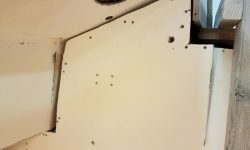 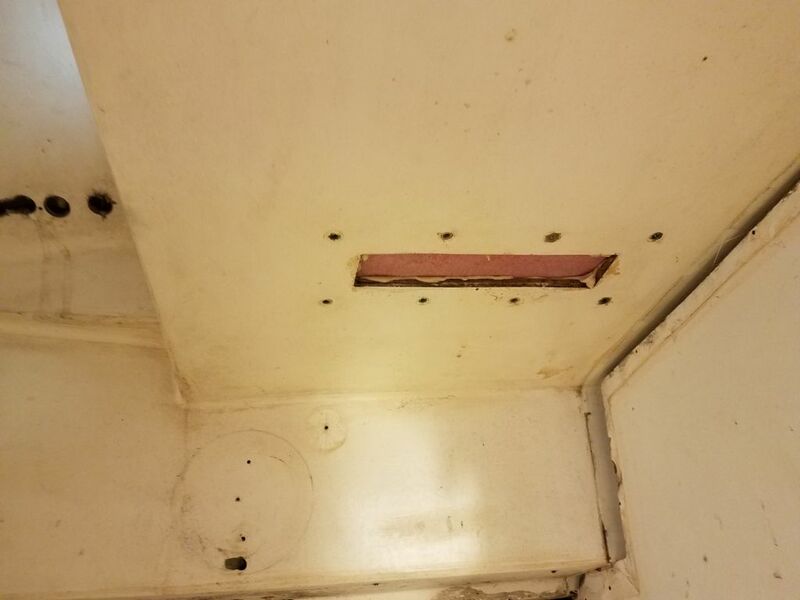 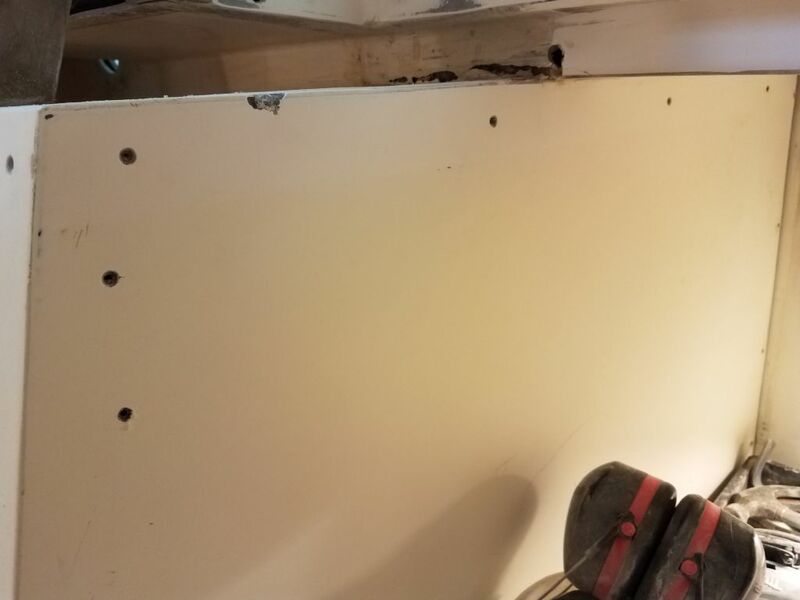 Afterwards, I went around the interior with a drill and countersink bit, and reamed out all the old screw holes throughout the interior, making the holes wider to better accept epoxy filler. 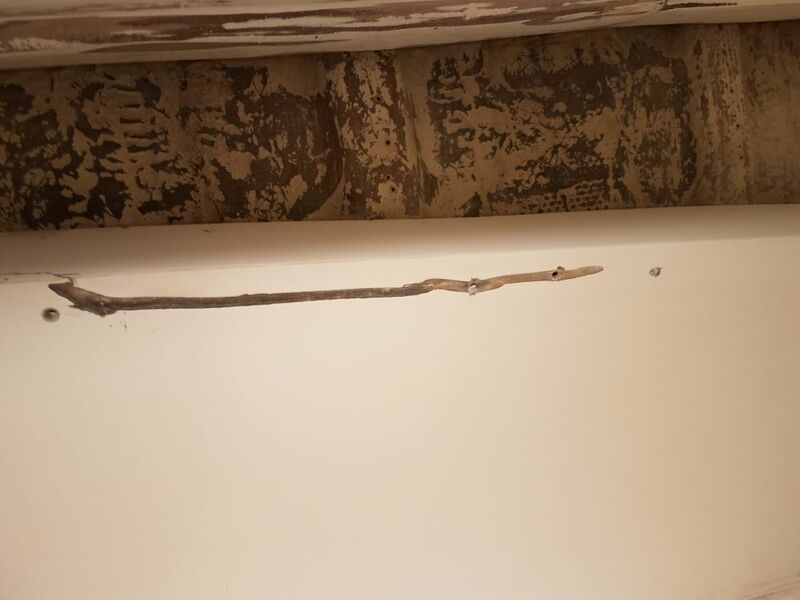 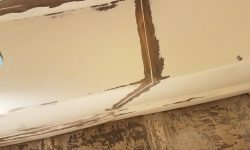 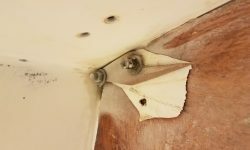 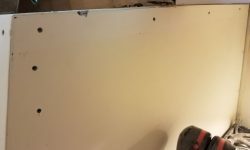 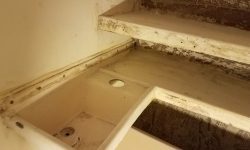 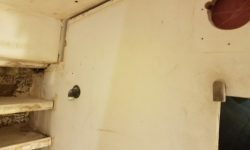 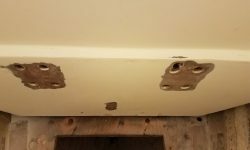 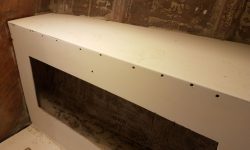 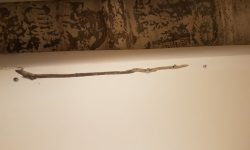 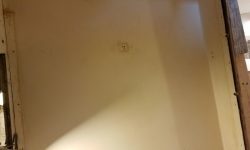 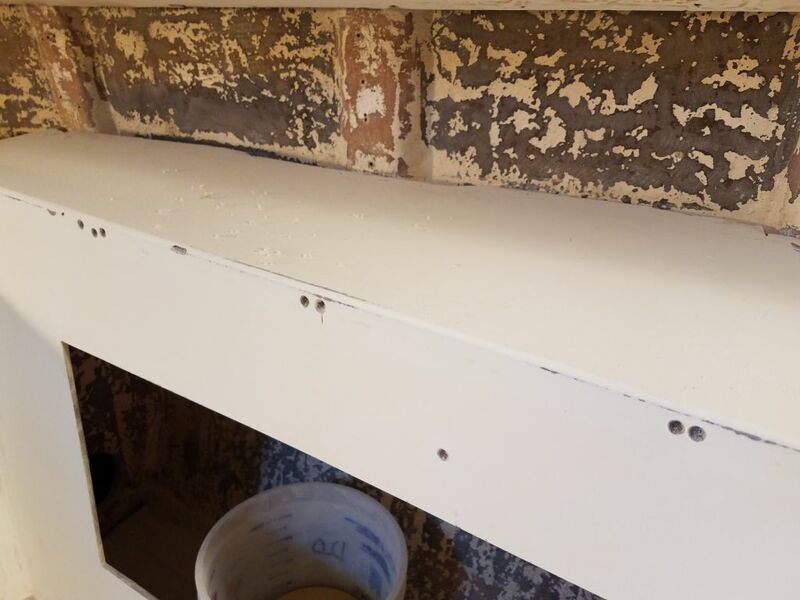 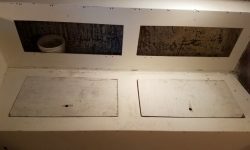 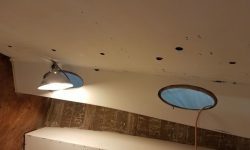 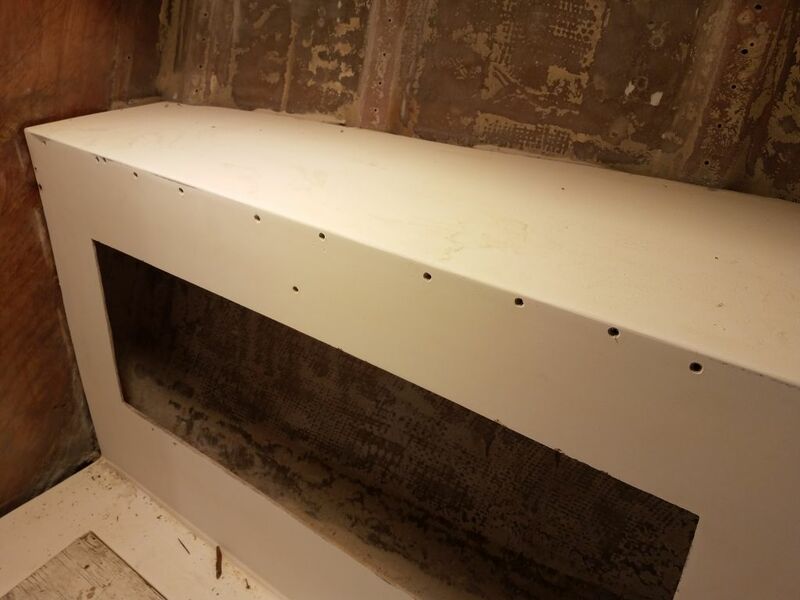 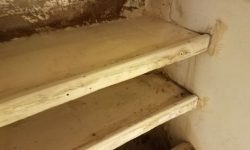 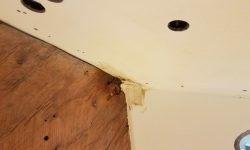 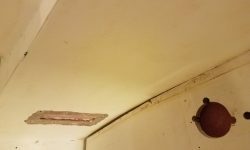 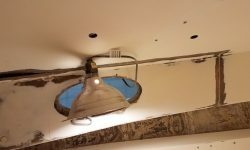 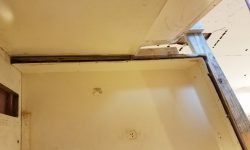 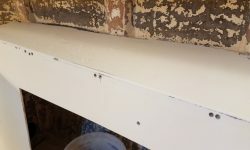 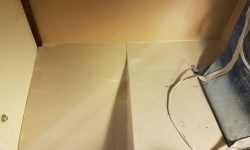 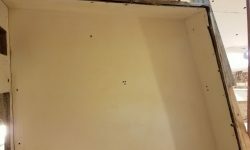 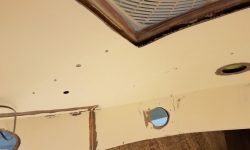 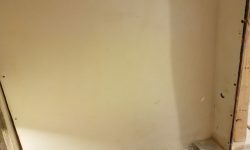 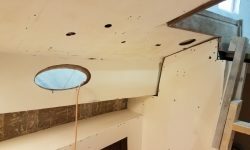 I liked to start with a clean slate and not be tied to any existing holes, particularly in a situation where I wasn’t sure how new trim and other details would come together. 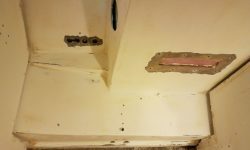 Next, I used a grinder to open up a few cracks here and there, mainly in sections of the port side where the liner had apparently once been cut out for access to the hull and deck. 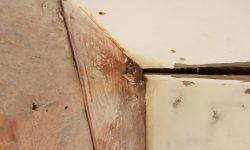 These seams had opened up in places, and the non-reinforced seams would show through new coatings unless I improved the bonding. 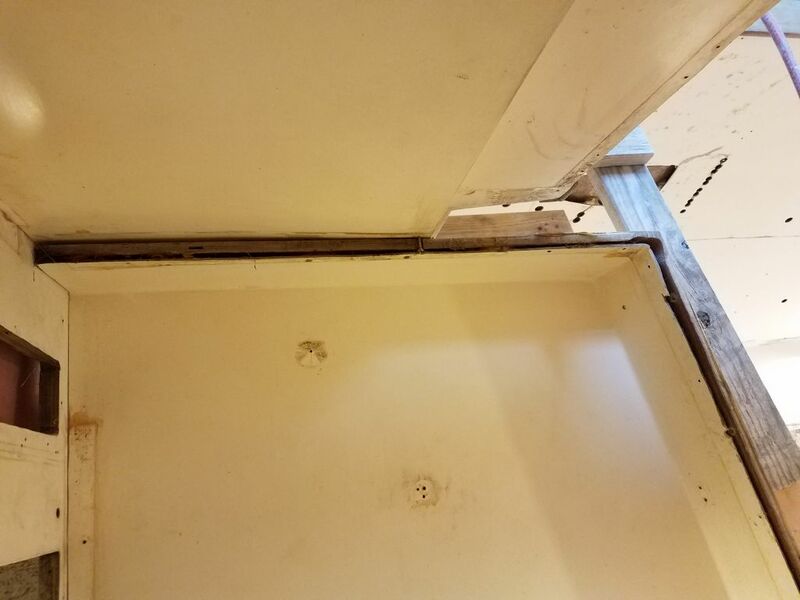 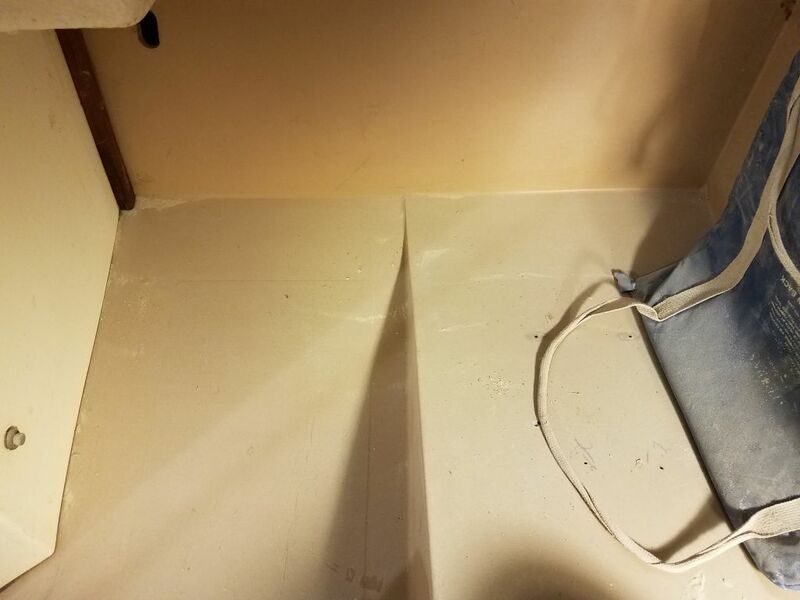 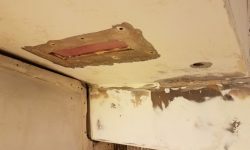 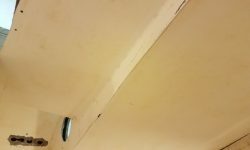 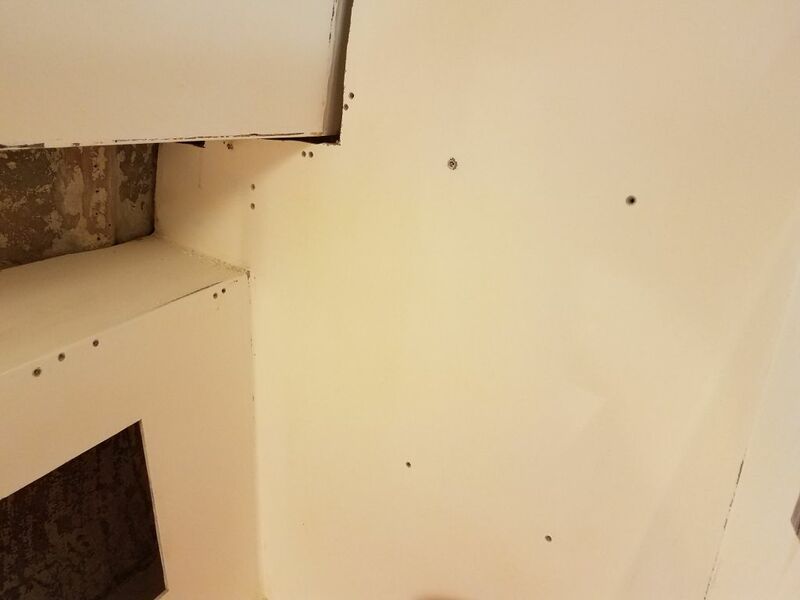 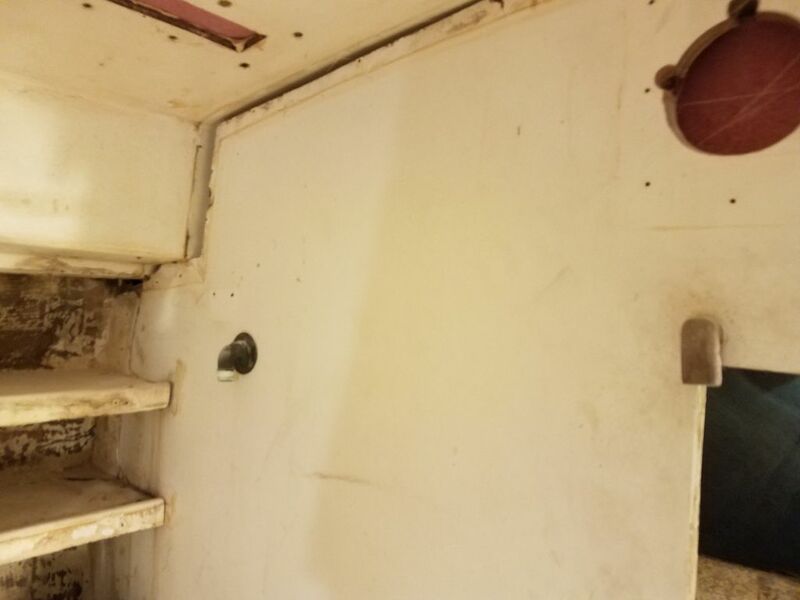 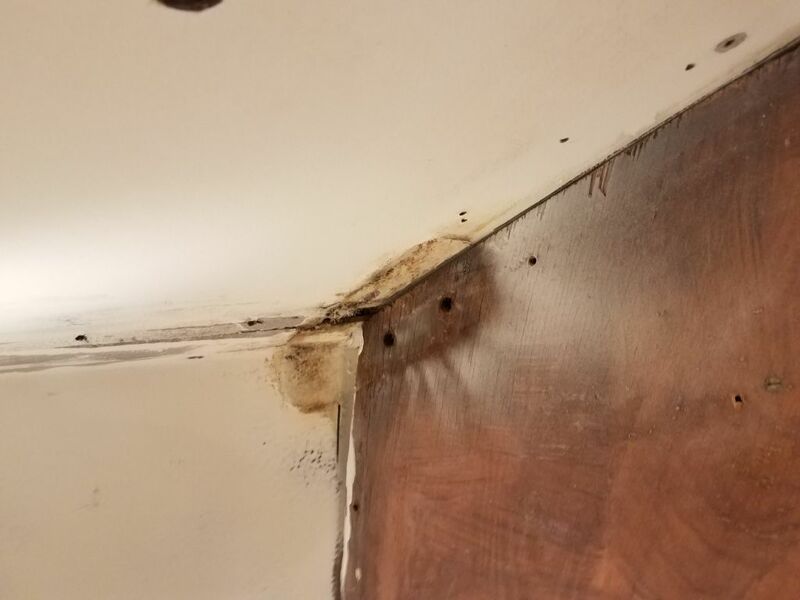 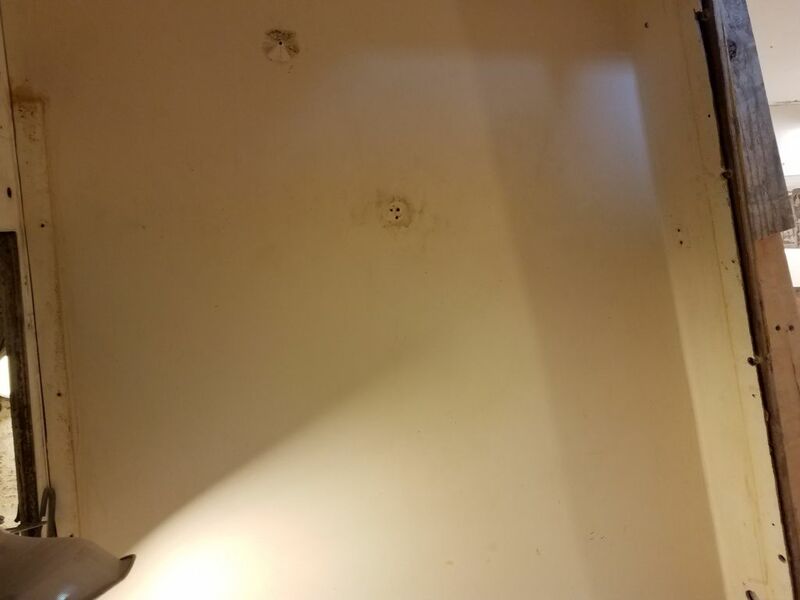 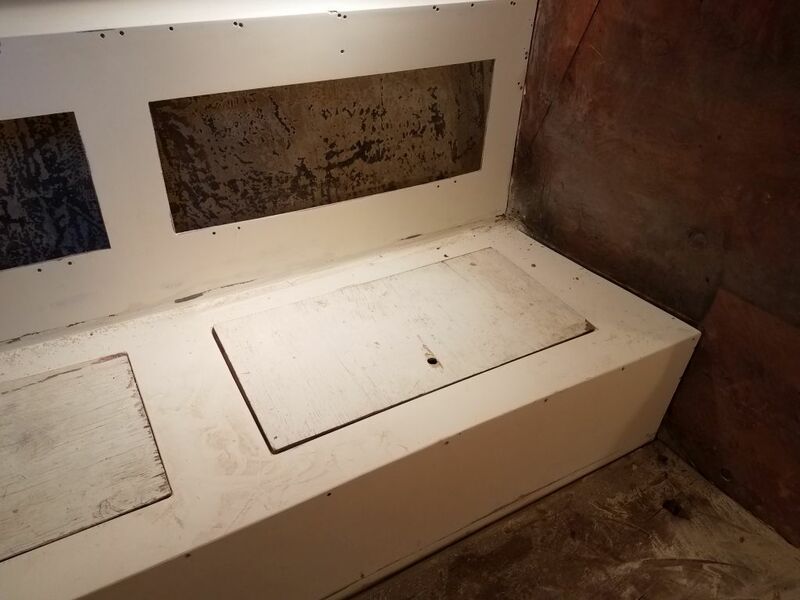 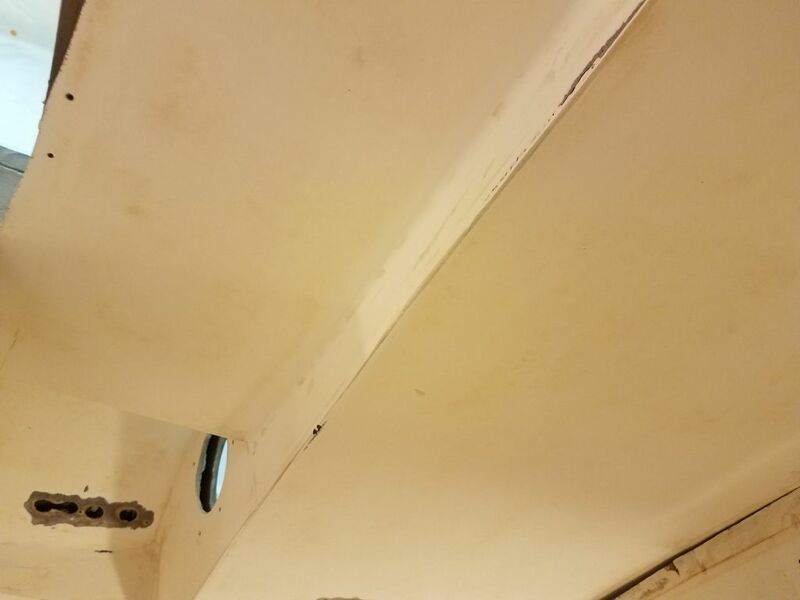 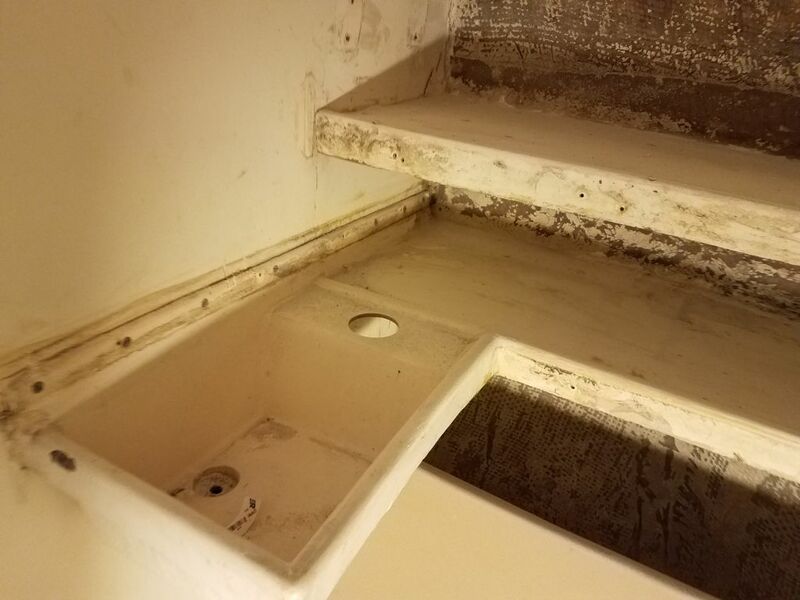 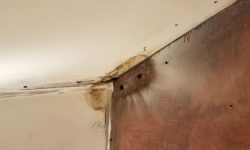 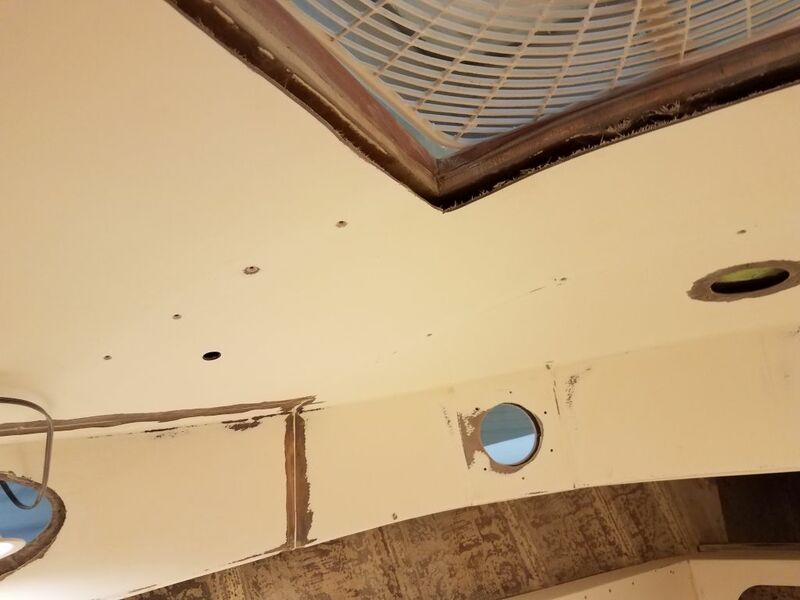 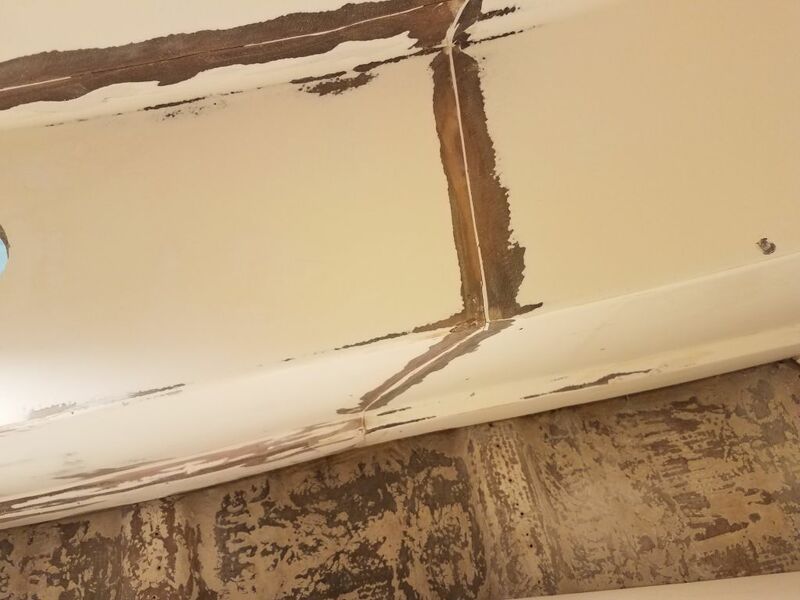 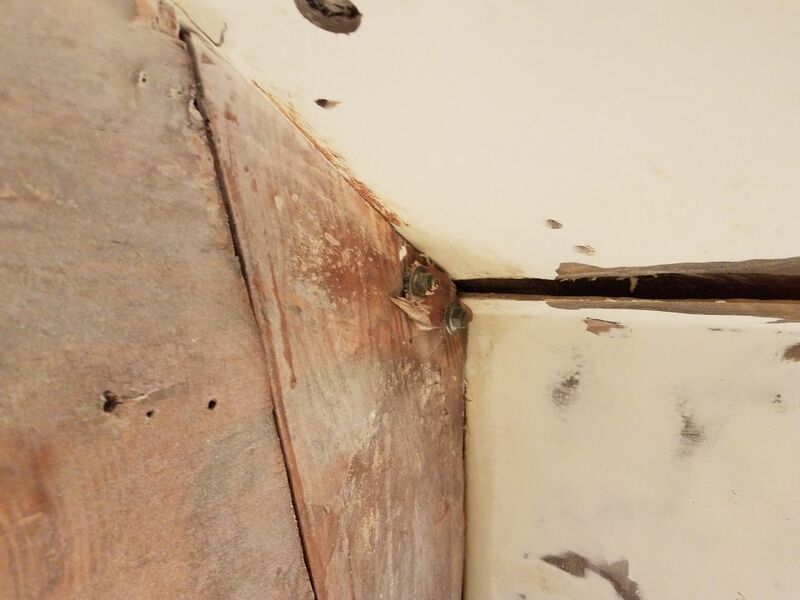 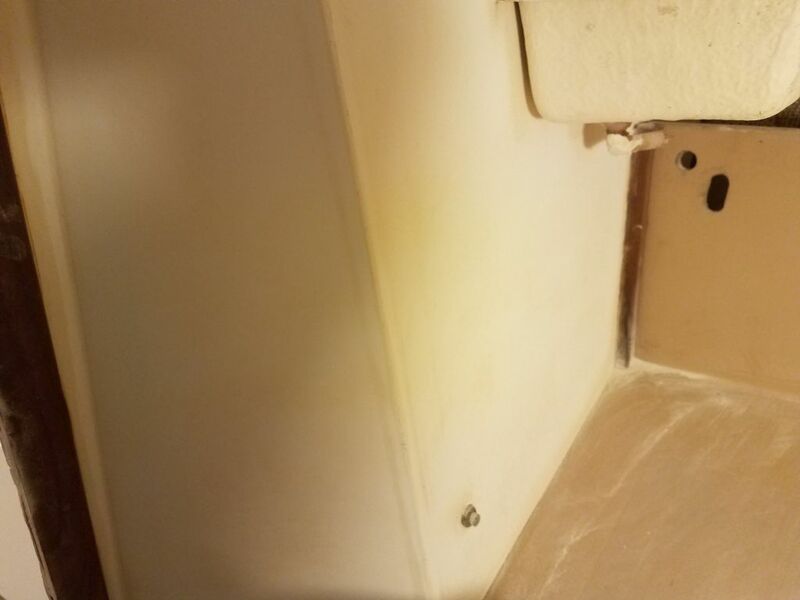 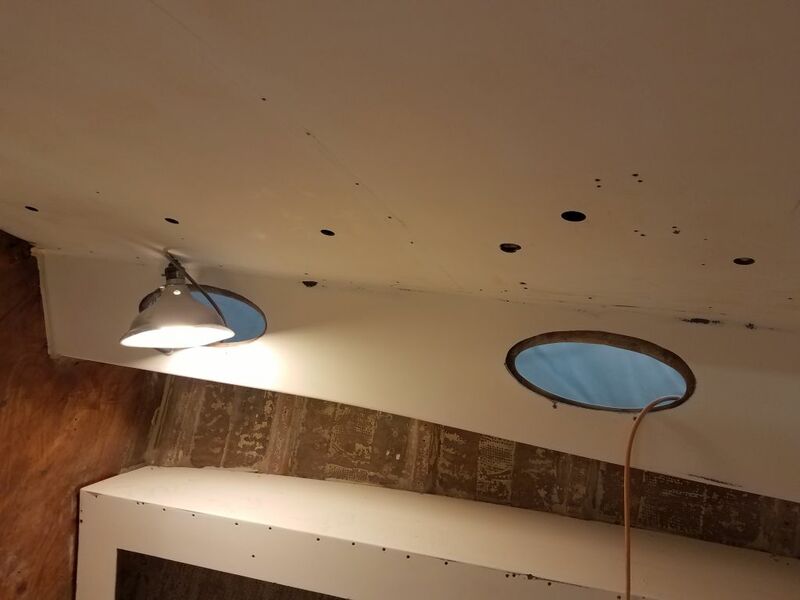 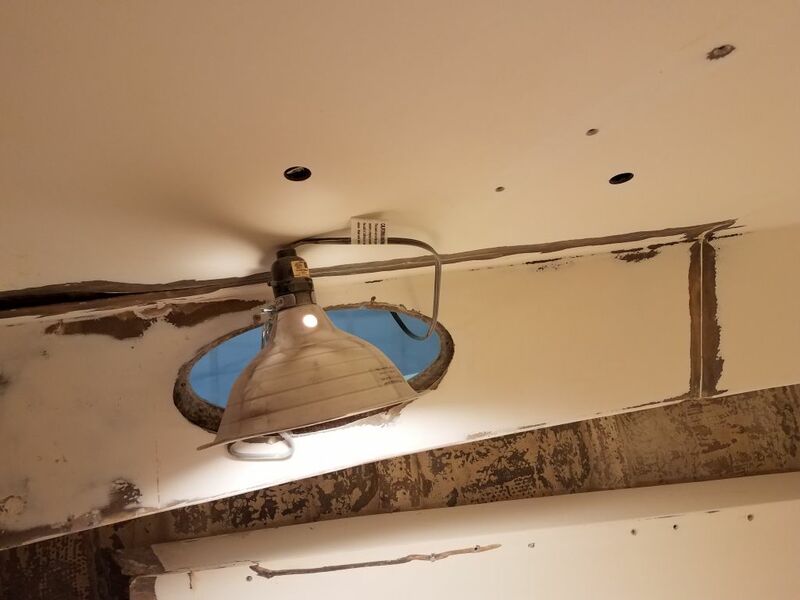 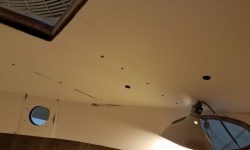 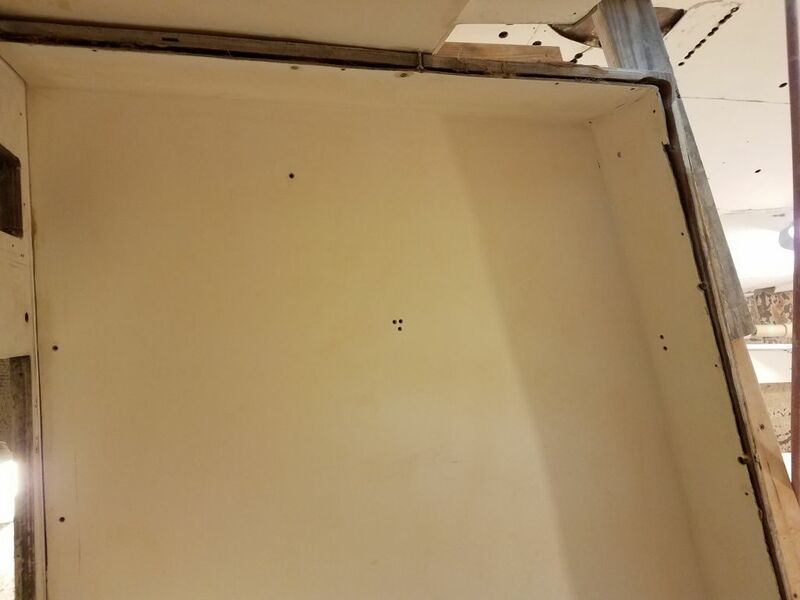 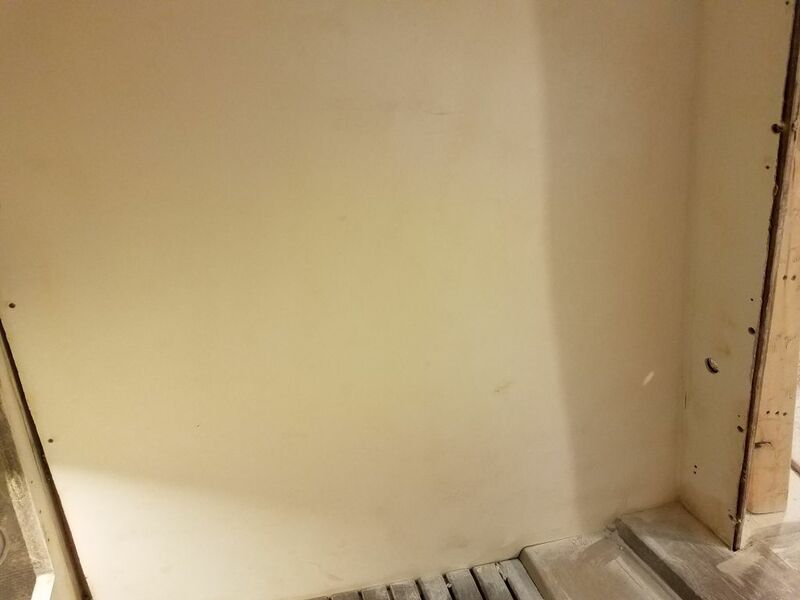 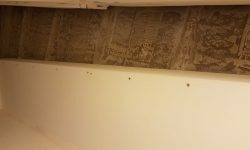 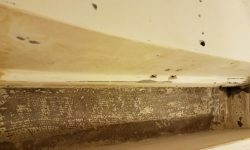 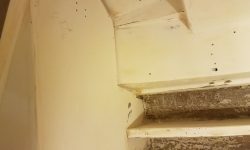 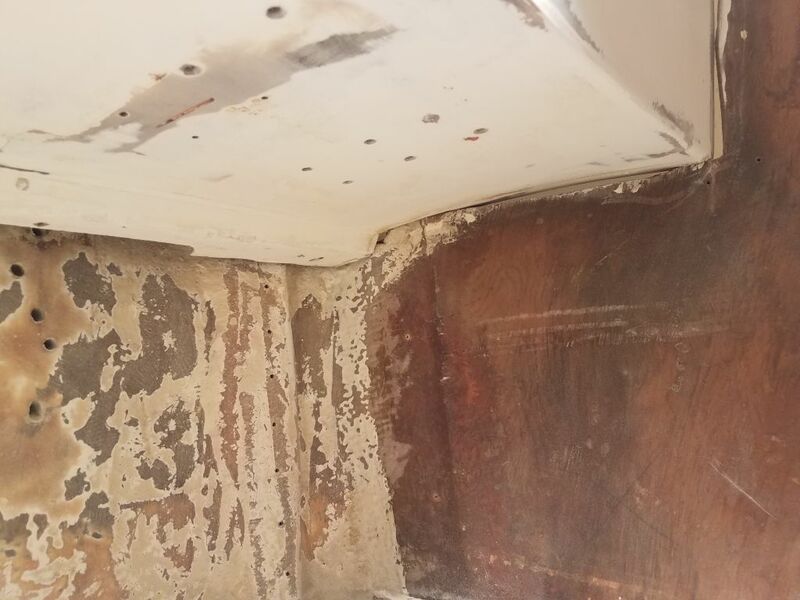 I kept these areas minimal, since this was just a non-structural interior liner and my only purpose was to better hide these seams and old cracks. 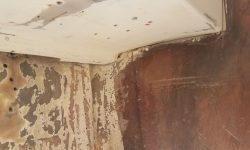 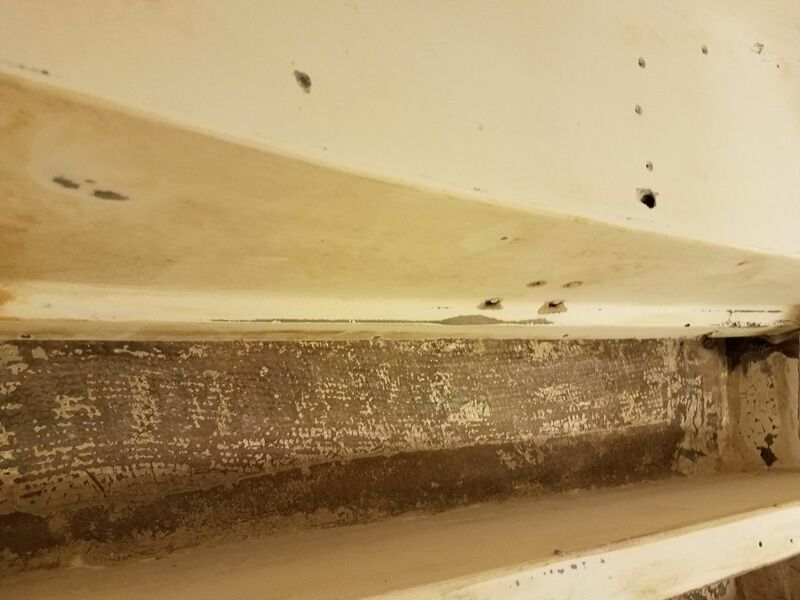 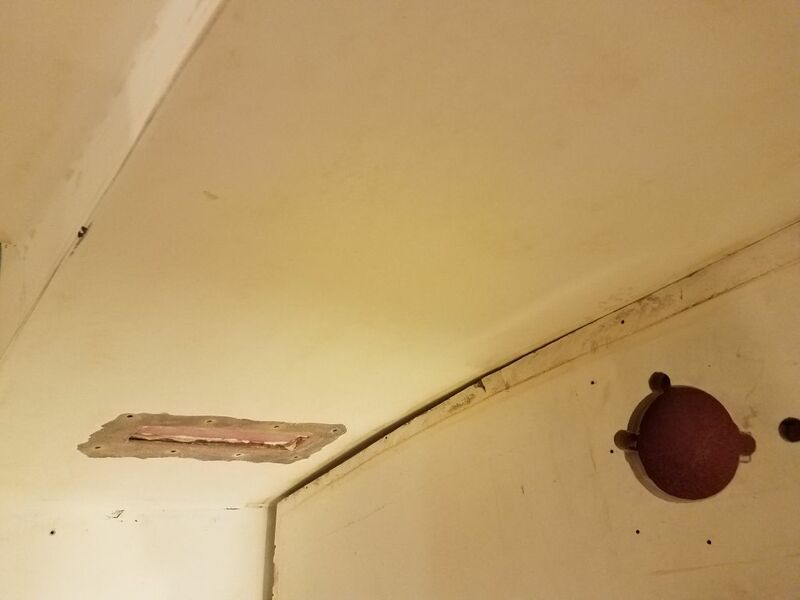 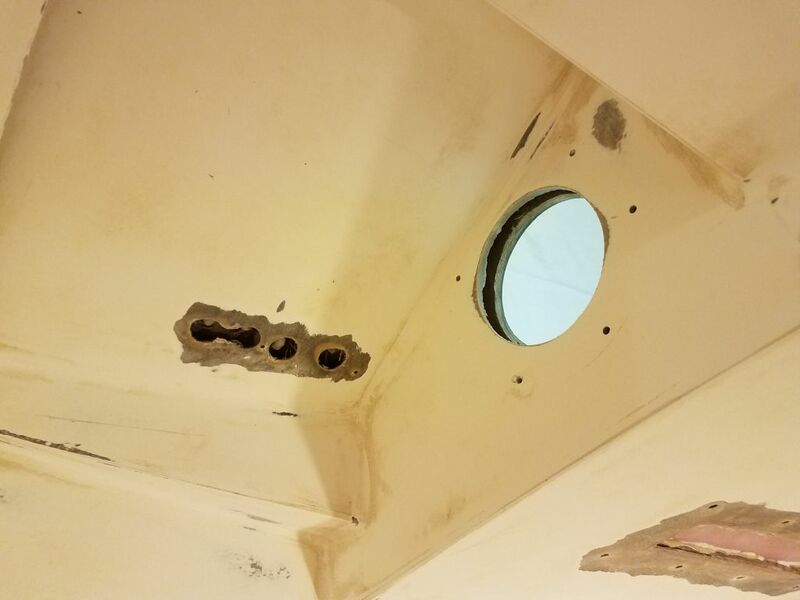 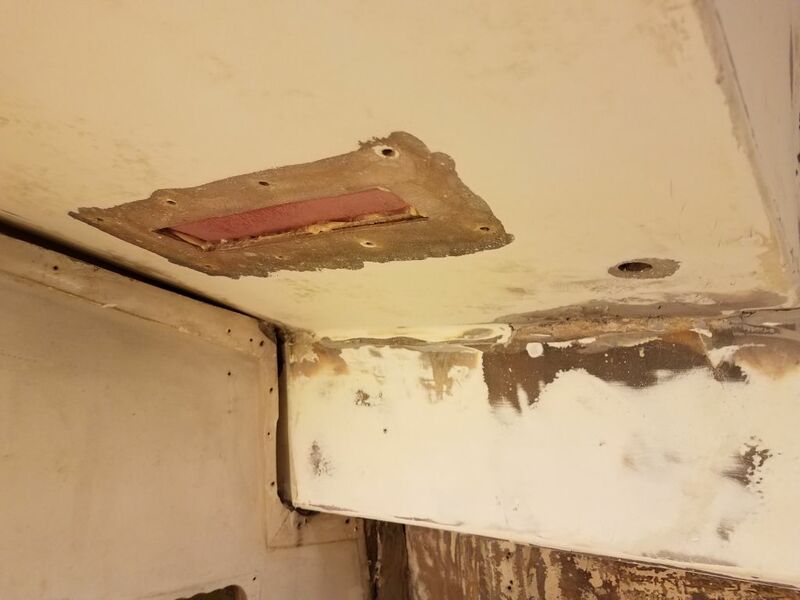 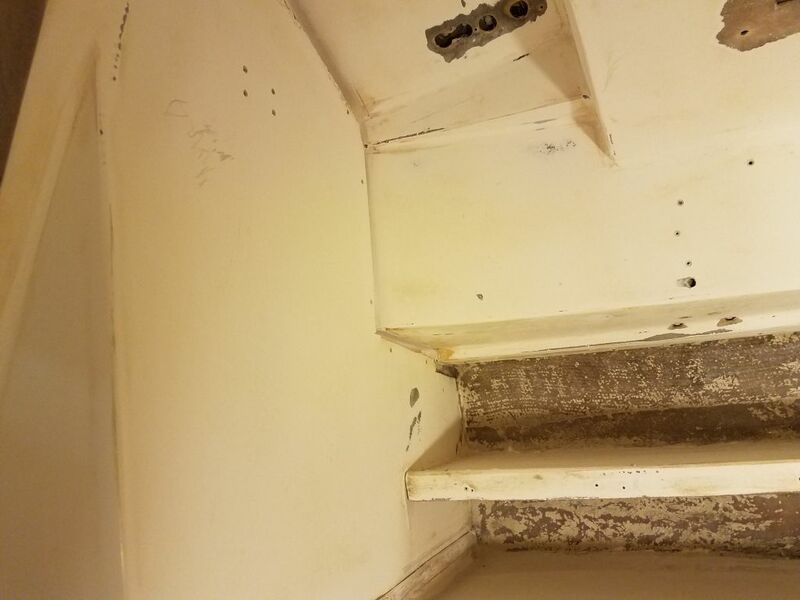 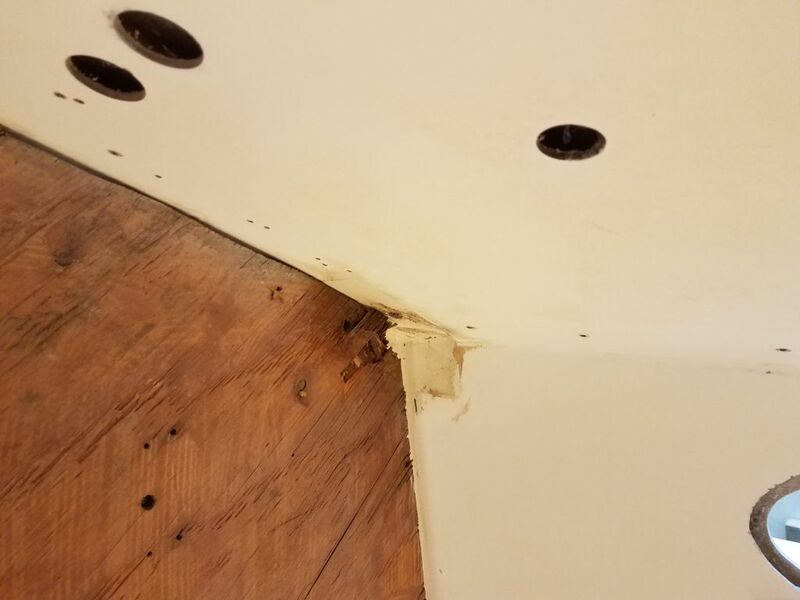 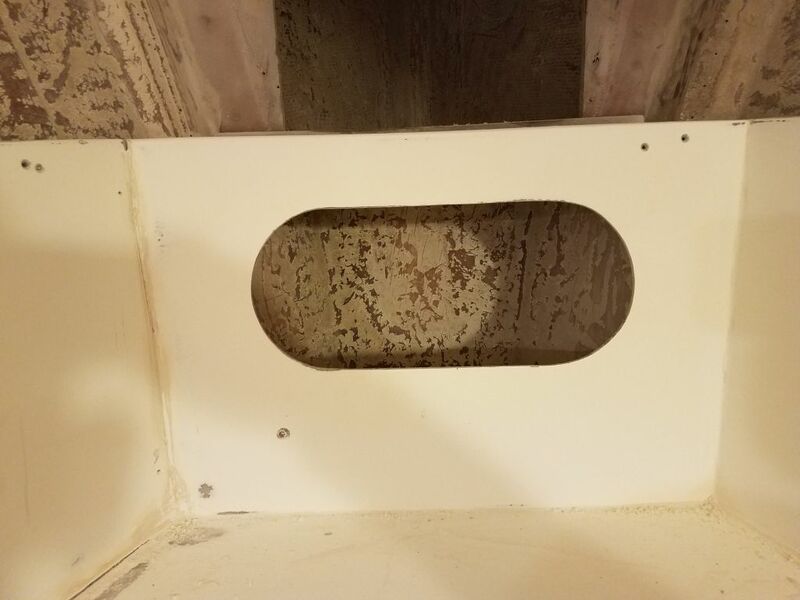 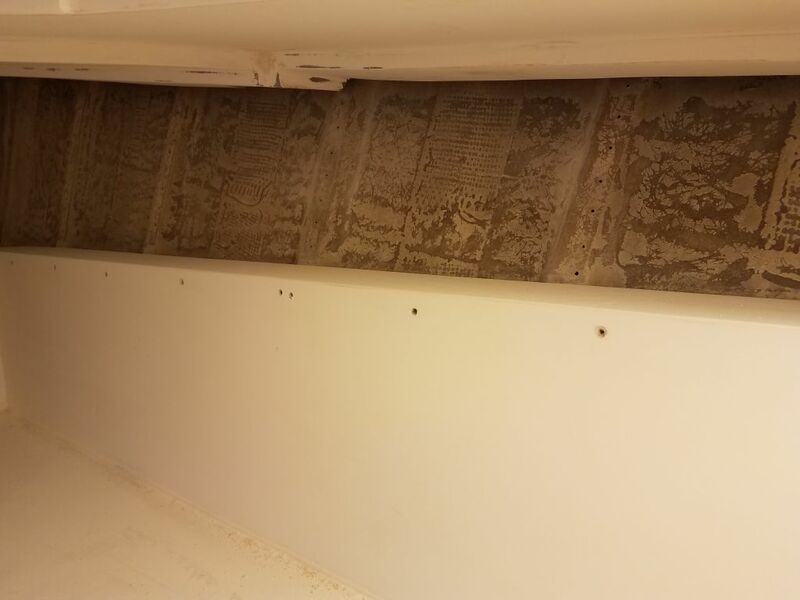 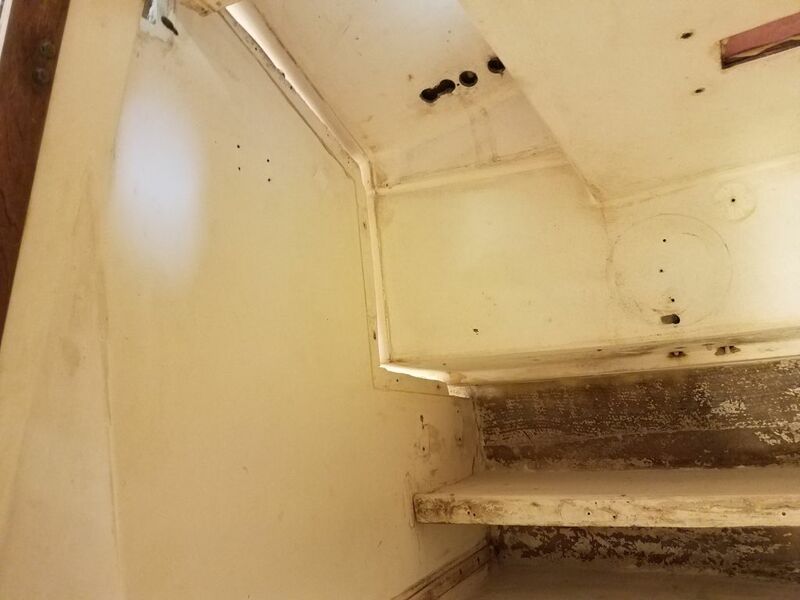 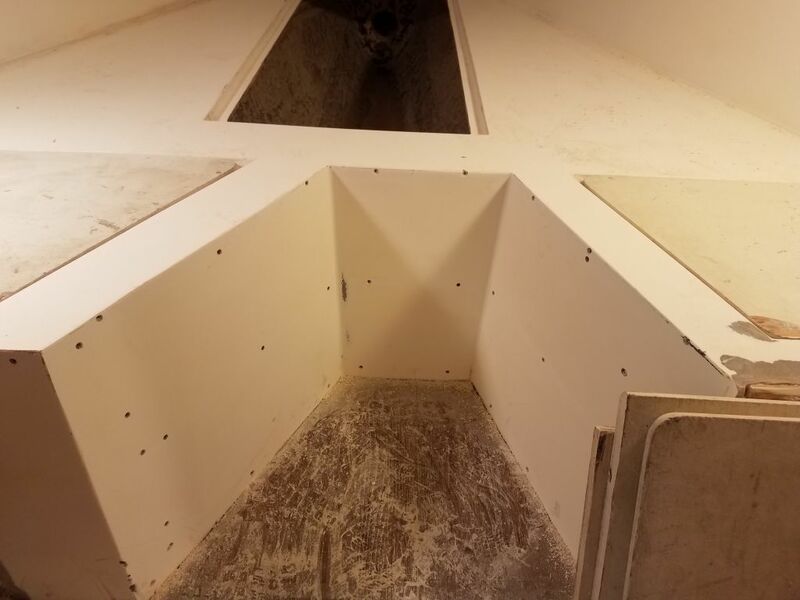 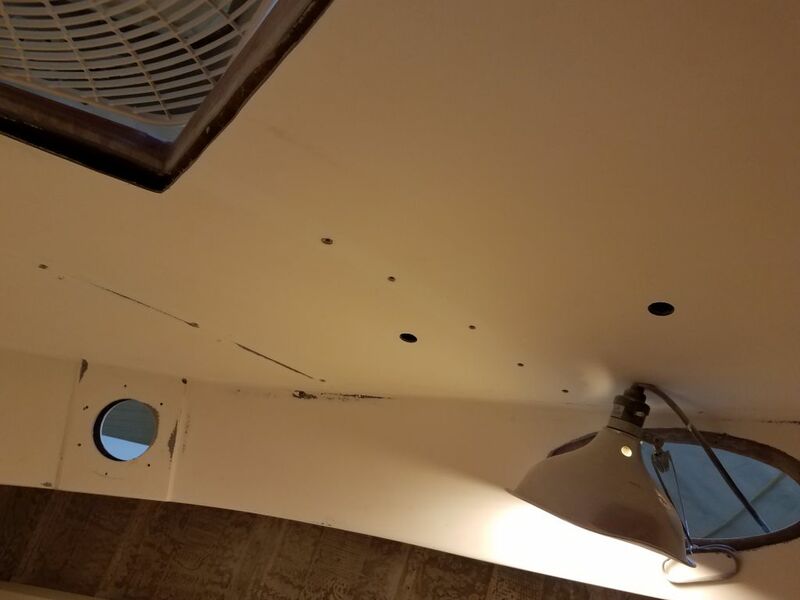 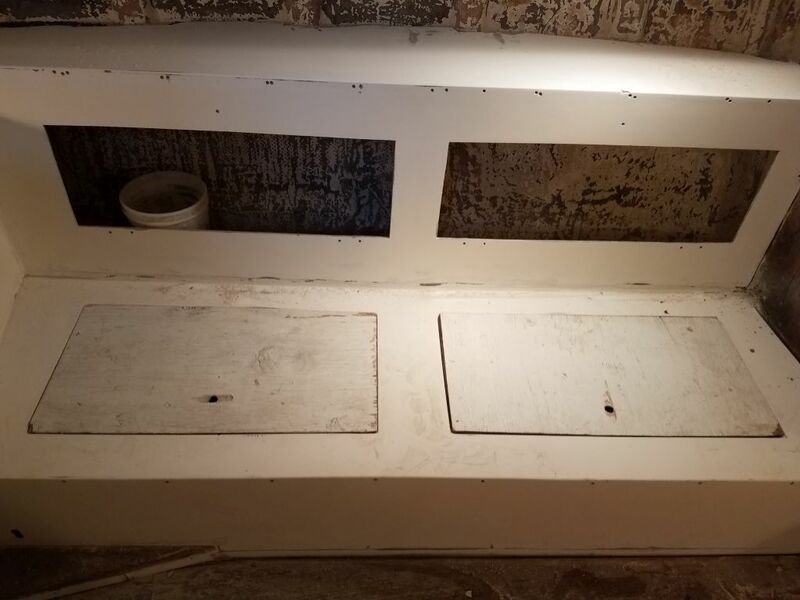 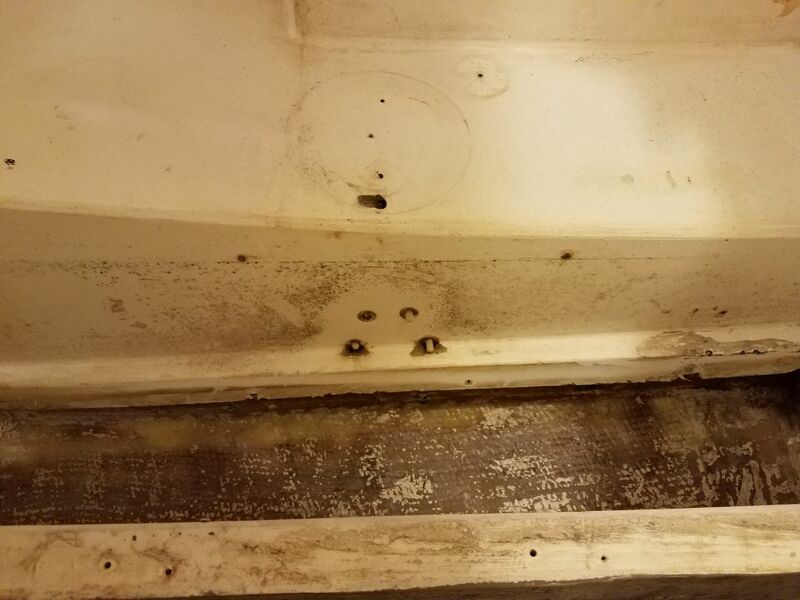 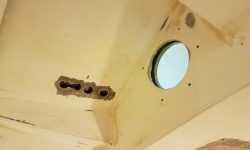 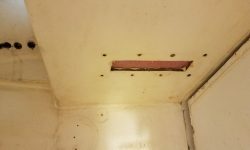 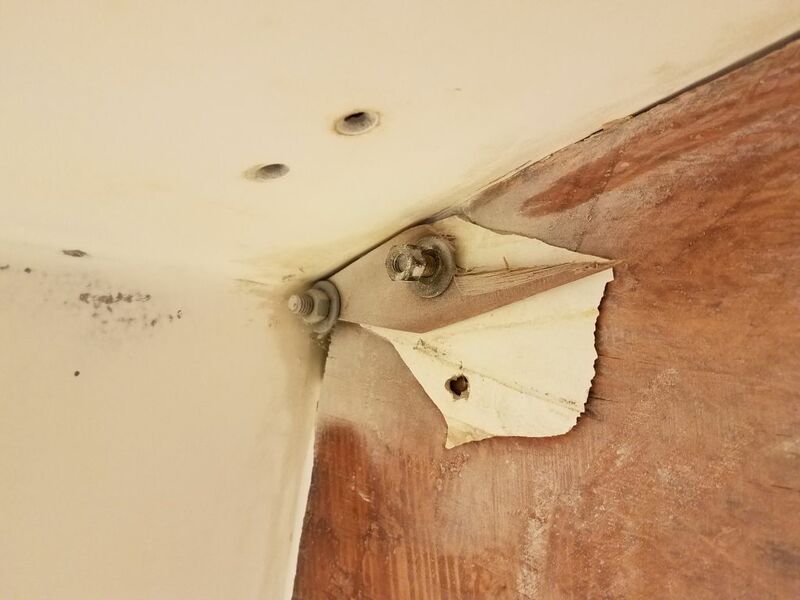 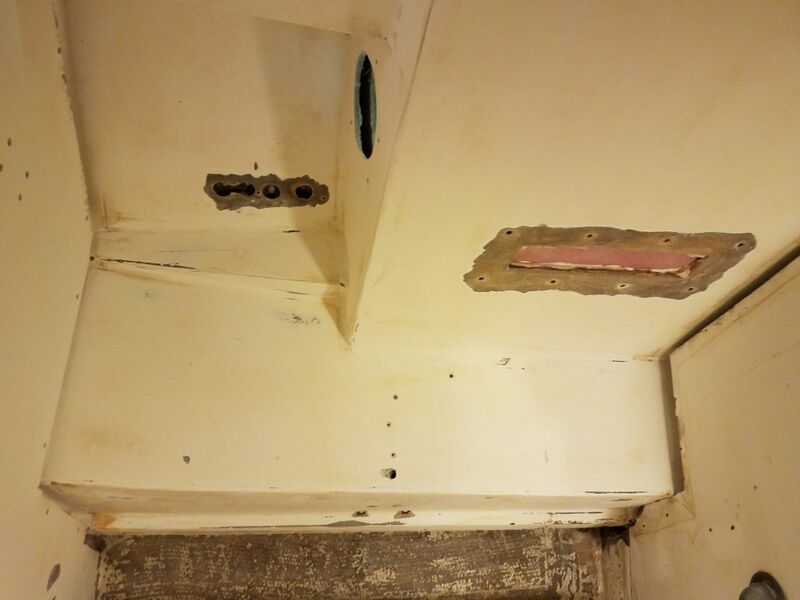 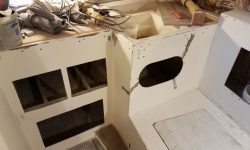 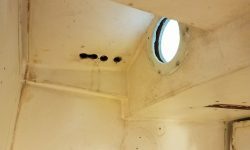 While I had the grinder out, I prepared the area around the old deck prism above the galley, and also some old fastener holes beneath the foredeck that required more substantial filling and patching. 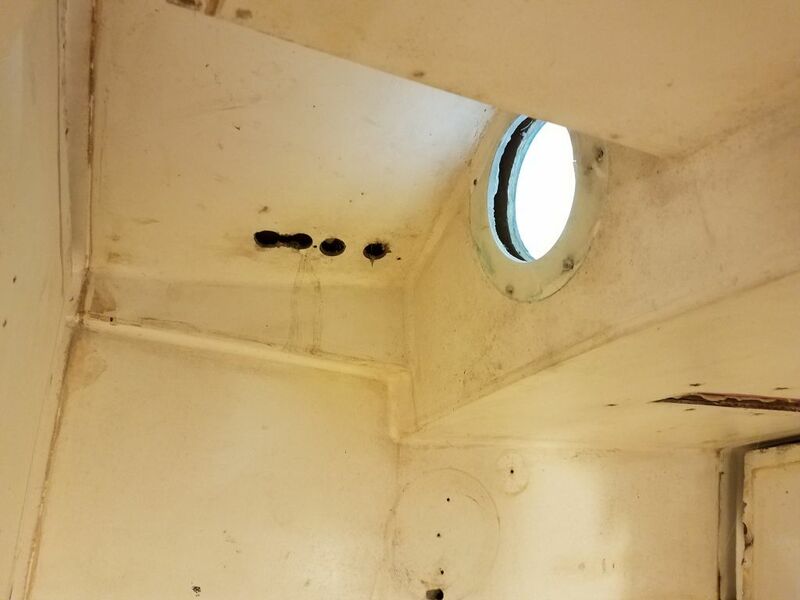 The main bulkhead was tabbed along the hull, but not at the decks, and originally (or at least as-delivered here) the bulkhead was pinned at the top corners by wooden blocks, which were bolted through the bulkhead and had once been bolted awkwardly through the deck. 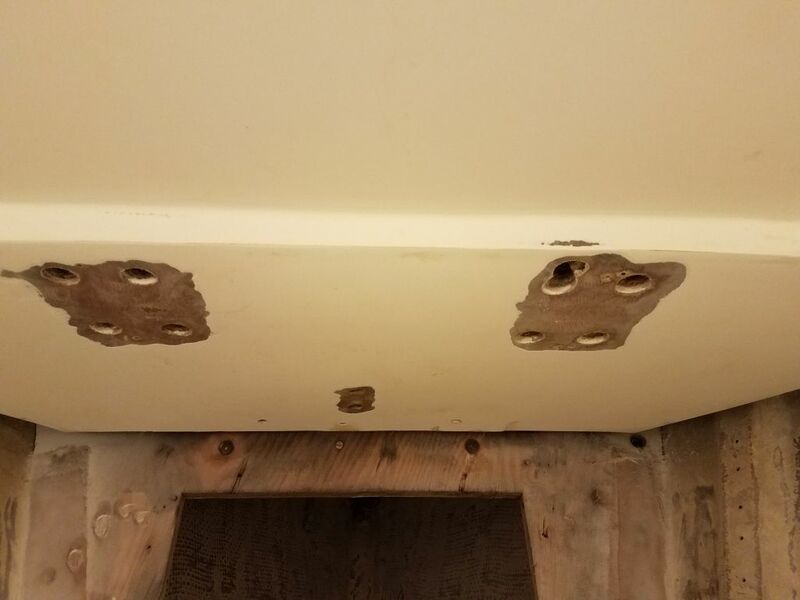 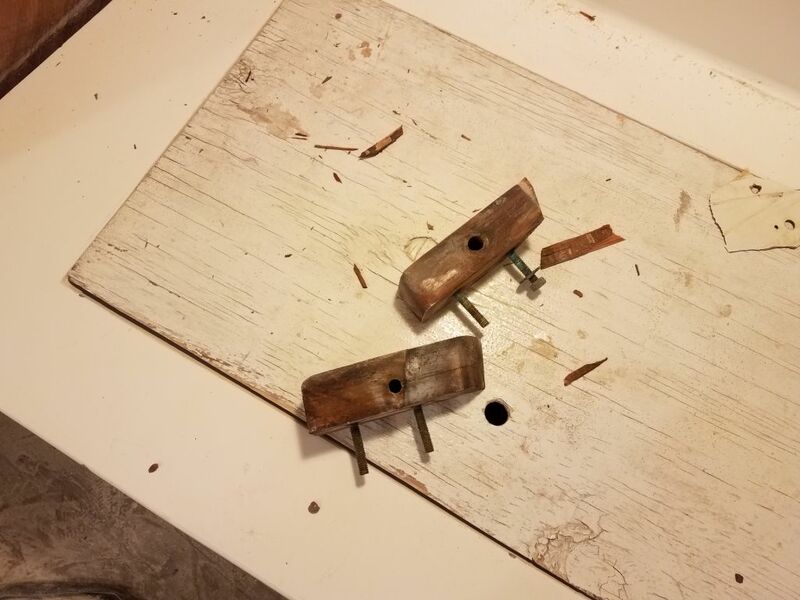 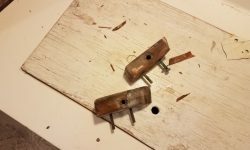 I’d removed the large bolts through the deck during that phase of work, and now I finally got around to removing the blocks and their remaining bolts from the bulkheads. 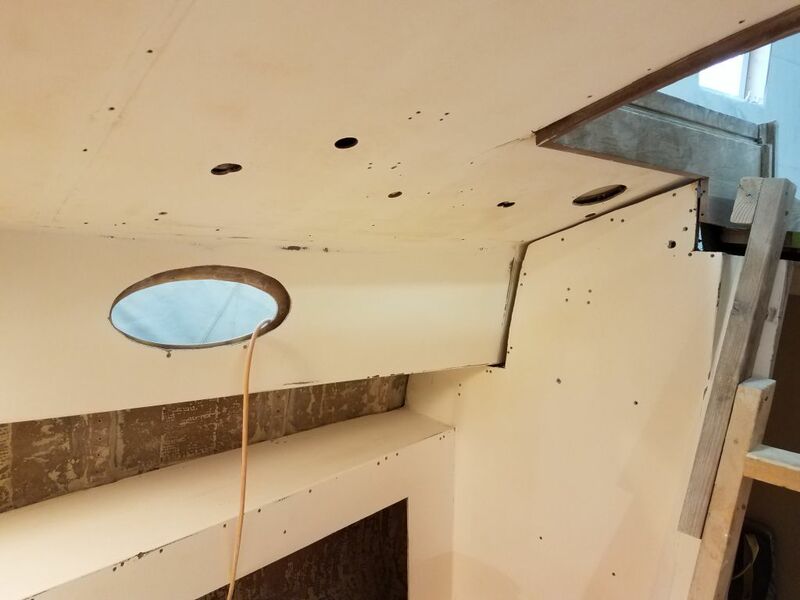 Later, I planned to tab the main bulkhead to the deck throughout. 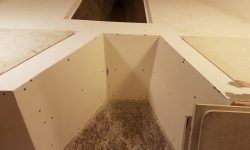 The final area requiring bulk surface preparations was the head compartment, with myriad small but multi-faceted surfaces to prepare. 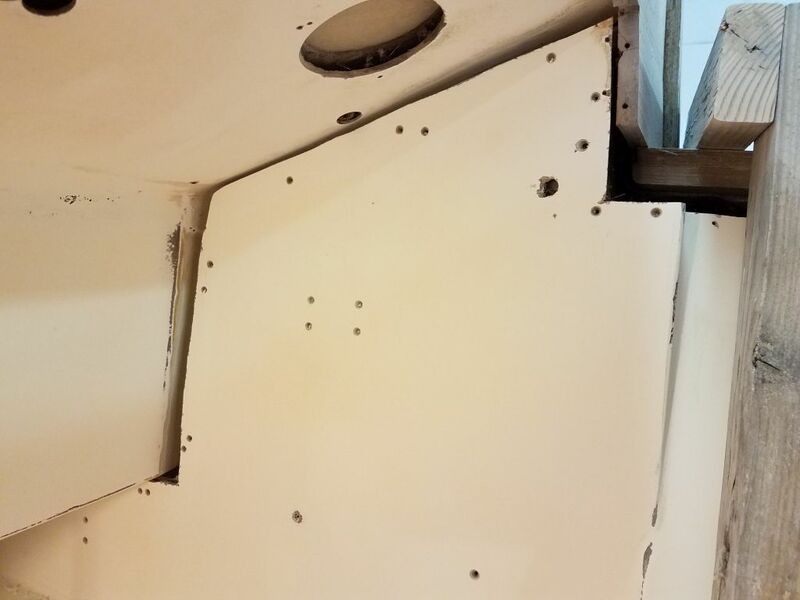 As in the galley, the after bulkhead here was covered with Formica and didn’t need the sanding prep at this time. 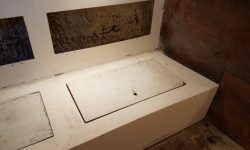 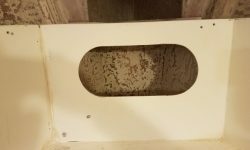 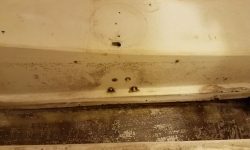 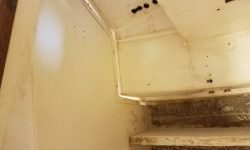 For the moment, I also chose to leave alone the molded sole section, which incorporated a shower pan as well as a molded nonskid area, plus a platform for a toilet. 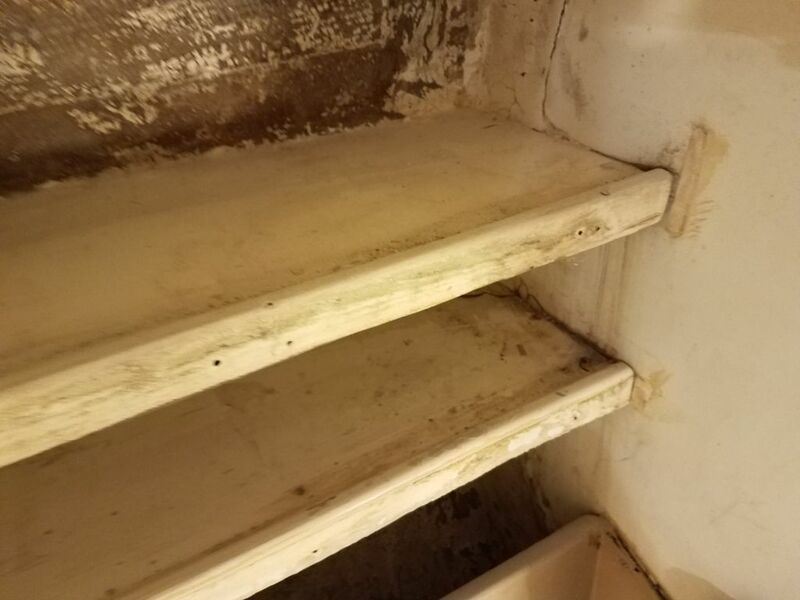 This section was a different color and was in pretty good shape as is, and on the off chance it could be kept as-is, I avoided it for now. 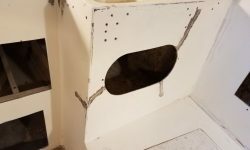 After various rounds of sanding with different tools and by hand, followed by hole reaming and some spot grinding to prepare a couple areas for larger patches, I completed the basic head surface prep to the same level as the rest of the cabin.